Summer is the best time to break out the Dutch oven and make a pot of Dutch Oven Molasses Baked Beans. I’ve been making variations of this recipe for years. It’s always a crowd favorite and a perfect accompaniment to any barbecue meal. You can make these while out camping or even in your backyard. I’ve included a little step by step photo tutorial, because I know how much you love a good picture story. Have a Happy 24th of July (Pioneer Day in Utah) ! From left to right…molasses, yellow mustard, brown sugar, ketchup. Measure them out. Get ready to dump. Dump in the brown sugar and ketchup. Are you bored yet? My friend Melinda tells me she likes the step by step. Place the lid on the pan. you don’t need one of these fancy tools, but we bought one after many years of having dutch ovens and we think it’s pretty useful. Large pliers also work. Gloves are good too. Cook for about 40 minutes or until bubbly. this is how they’ll look when done. A side note to my story. Some of you are very observant. You email or leave a comments about details in photos. Such as- why do there appear to be SO MANY COALS under the Dutch oven???? Because friends, this is why. My husband thinks that whenever we pull out the Dutch ovens, the cooking expertise shifts from me, to him. He insists on placing half of the bag of briquettes into the chimney we use to heat up the coals. Even if it’s a 50 lb bag. Not really, but it seems that way. You know how men are. Fire is good. More fire is twice as good! Anyway. He is an out of doors expert, and I am not, that is a fact. But I’m a cooking type of person, and he is not. Also a fact. So we always have “words” when we attempt Dutch Oven cooking. The convo usually goes like this. G: I am doing this. Me: You’re using too many coals. G: Who is doing this me, or you? What do the Scouts know? That’s one good looking pan of beans. Light briquettes, follow package directions. Place about 10 hot briquettes in a circular pattern on the ground. We like to use an old metal pan under our dutch oven. Place the dutch oven on top of the briquettes. Place the chopped bacon and onion into the dutch oven. Cook until the bacon is slightly crisp and onions are softened. Drain any excess grease. Don't worry about removing every bit of bacon grease. Add the remaining ingredients, stir. Place the lid on the beans and using a pair of tongs, place about 16 briquettes on top of the lid and leave 10-14 under the dutch oven. Let the beans cook for about 40 minutes or until bubbly and hot. This will vary in cooking time depending on how much wind there is, the amount of coals you use, the temperature of the coals, etc. If you feel the beans are cooking too fast, remove some of the coals. When ready to serve, carefully remove lid, so the ashes do not get into the beans. Sometimes, if our beans are cooked and very hot, we dump the ashes, and simply leave the lid on till ready to serve. Tips:-There are many sources for Dutch Oven cooking online. Here are a couple :Scouting Magazine (Dutch Oven Cooking 101)Camp Cooking Outdoors-You may use any brand of beans, Van De Camps is a brand found in most grocery stores. I used a brand I purchased from a wholesale food distributor.-This recipe may also be made in the oven. Cook the bacon and onions, drain the grease and add the remaining ingredients. 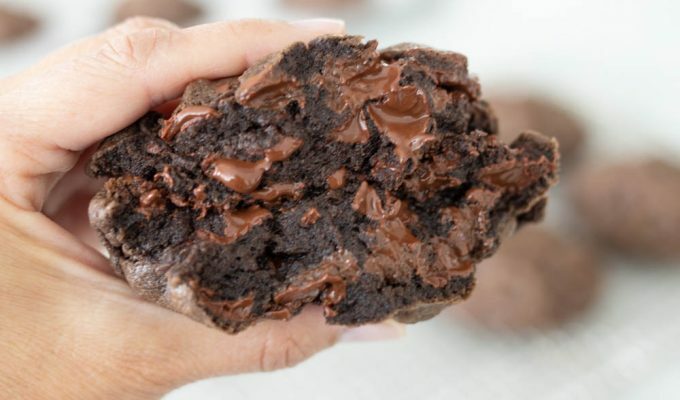 Bake at 375 for one hour. 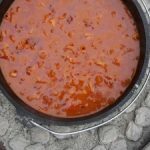 Love a good Dutch oven recipe and these baked beans look so yummy! My question is about the “tray” you have under the Dutch oven. I have not seen that before & I’m now on the hunt for it! What & where did you get it from?? It’s an old disposable bbq grill pan, the type you buy at a drug store!